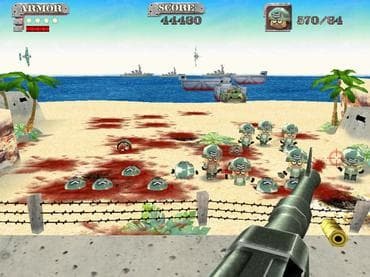 Thousands of enemy troopers, tanks, aircraft, all up against you, a lone warrior armed with heavy machine-gun and unlimited ammo. What can you do alone? Can you survive the bloody slaughter? Kill'em all and stay alive? Download free full version game and you will know! Free Game Features: - Endless Hours of Pure Action; - Tons of Levels; - Deadly Enemies; - Four Difficulty Levels from Rookie to Insane Action; - Stunning 3D Graphics; - Save / Load game option; - Game statistics; - Free full version game without any limitations. If you have questions about Onslaught game, please contact us using this form.